I had some video files sitting around that I wanted to convert to a format that I could use with the Apple TV (Second Generation). I tried dumping them into Handbrake on the Mac, which usually does an excellent job of converting, but it crashed every time. As far as I could tell these files were encoded with XVID. I’m not 100% certain but that appeared to be the issue. To get around this problem I ended up using ffmpegx. In my case, it worked perfectly. I used it to convert the XVID encoded avi files to H.264. I was then able to watch them via the Apple TV. 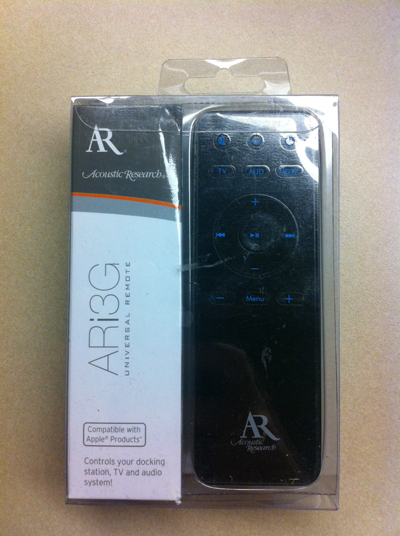 The Short Version: I don’t think the ARi3G remote is worth buying, not even as a backup remote. You’re better off paying more for an original Apple TV remote, which you’ll be more satisfied with. 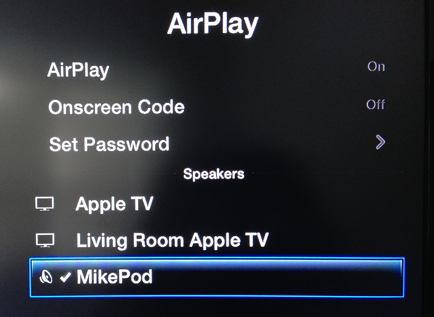 We’ve been having issues with the range of the Apple TV remote when used with the X10 IR repeater in the bedroom. It seems to work fine in the living room but in the bedroom the remote range is probably about half of what it should be. I think the main cause of this problem is actually the IR repeater. However, the other remotes that we use do work better than the Apple TV remote. 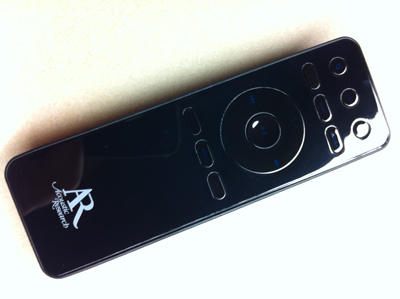 I decided to purchase an Acoustic Research ARi3G remote, which is made to work with an Apple TV. My assumption was that it would have better range since it uses two AAA batteries, instead of the watch battery the factory remote uses. It only cost about $10. Unfortunately, it doesn’t seem to be any better. The range is exactly the same. In addition, the main “play” button doesn’t seem to function consistently, which makes it a pain to use when fast-forwarding. The motion-activated back-light is too sensitive. Any movement on my bed would trigger it on even though it was sitting on a separate nightstand. Granted, it only cost $10 but it wasn’t worth purchasing. After my wife got a laptop for her birthday the G5 sat around unused for quite some time. After we bought the Apple TV I decided to set it up as a media server. In this case, I’ve started converting DVDs to an Apple TV 2 compatible format and dumping them into the iTunes library of the G5, which I’ve setup again. So far I’ve only converted around 20 DVDs, but that number is slowly increasing. On several occasions we’ve streamed these movies to the Apple TV, which has worked great. At the moment, I’m focusing on converting the movies that we like to watch from time to time. It’s been a long time since I posted something in the “Multi-Media Server (MMS)” category.